The Rev Jason Kernohan meets some members of the congregation during the recessional hymn. A large congregation was in the Parish Church of All Saints’ Eglantine for the institution of The Rev Jason Kernohan as rector. 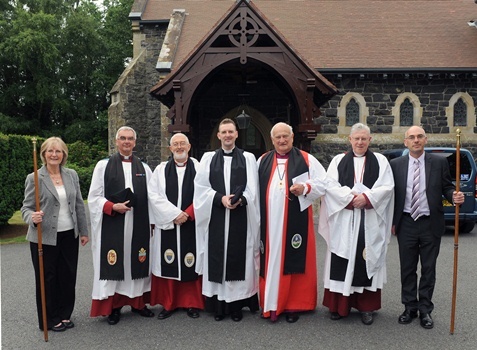 Jason, former Curate Assistant in the Parish of Drumachose, Diocese of Derry, was instituted by the Rt Rev RHA Eames, Lord Eames of Armagh on Thursday July 9. 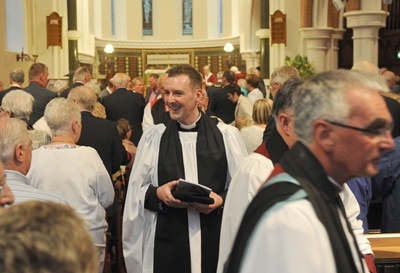 The 36-year-old is returning to his home diocese of Connor. He grew up in Ballymena, attended Cambridge House Boys’ Grammar School and was a parishioner of St Patrick’s Ballymena. Rev Jason Kernohan and clergy prior to the service of institution. In St Patrick’s, he set up a parish music group, and was involved in Bible Study and House Groups, the choir and was a Parish Reader. Jason made music his full time job when he left school, fronting his own band and releasing three albums and a DVD. He plays piano, violin and accordion. In 2007 Jason stepped away from his music career to train for the ministry in Dublin, but he has never lost his love of music or of performing. 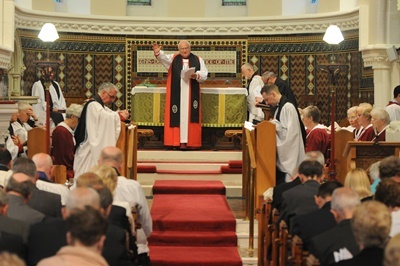 The Rt Rev RHA Eames gives the blessing at the service of Instution of the Rev Jason Kernohan in Eglantine Parish Church. Jason said he was looking forward to the challenges of a new ministry in a new place, and to getting to know the people of Eglantine. 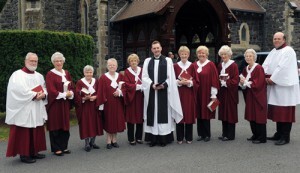 The Rev Jason Kernohan pictured with the parish choir prior to the service of institution.